The anatomy of a survivor starts at the top, from head to toe. Unless an individual is mentally prepared to survive a catastrophe, he will likely perish. In an apocalyptic life and death scenario, fewer than ten percent of people are emotionally equipped to survive. 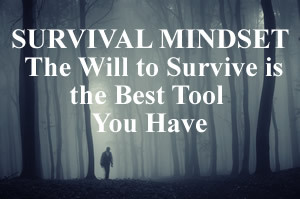 Survivors are mentally wired to assess the situation correctly, react quickly, accurately, and to make the necessary adjustments which a survival situation requires. The question is: Are these individuals pre-disposed genetically to survival at birth or are they created from their surroundings and upbringing. This issue has been studied extensively by John Leach, Author of Survival Psychology. His findings showed that survival is based many times on the individual, but also the nature of the catastrophe that they faced. As Preppers, we face many threats ranging from natural disasters to man-made economic or societal collapse. Our ability to survive is enhanced by our level of preparedness. We have the confidence of knowing that the survival skills and preparedness supplies are available to us for the long haul of recovery. That said, however, a panicked prepper will not be a survivor. Psychology Today states that "resilience" is "that ineffable quality that allows some people to be knocked down by life and come back stronger than ever". Rather than letting failure overcome them, they pick themselves up, dust off their pants and make lemon out of lemonade. They are able to regain their composure and emotional state of mind, then let things go. Resilient people actually gain strength from adversity. Survivors trust their feelings and instincts. Survivors are logical, thereby able to make a quick analysis of any situation. Many times they will act instinctively, quickly, often before others are able to grasp the severity of a situation. Intuition is not magical - but rather is it is formed from our past experiences and knowledge. It is difficult to define or quantify. The key is that you have confidence in your intuition and the survivor cannot be afraid to make life saving decisions based upon it. Survivors are creative problem solvers who can use their confidence and knowledge to bring people together into a survival group. Problems that may seem too difficult to overcome can be easily resolved by survivors who have mastered this synergy. Synergy is the great force multiplier, dramatically increasing the survival of a group. Survivors can take one plus one and make it equal forty-three. Survivors are obvious take charge people. Survivors will use their problem solving ability to gain the confidence of the group and help them survive as well. So the question again is: Are these traits something that a survivor is born with, or are these learned characteristics. I believe that while both are necessarily true, it is not too late for all of us to become survivors. The first step is preparation. Create a solid Preparedness Plan which will enable you to have confidence when the collapse event occurs. This is the first step in showing your desire and will to live. Next, practice being more aware of your surroundings. Study people. Watch their movements. Try to assess their background, attitudes, etc. This will enable you to develop an intuition about people and surroundings. Finally, study and learn about the threats that we face. Know the consequences of certain natural disasters or man-made catastrophic events. Role play in your mind how you would react to each. Do you have the supplies and tools necessary to survive such an event. If not, go get them. I wake up every day and ask myself: "If 'X' happened overnight what prep would I wish that I had the most." Then I go and get it. The first step to survival is preparedness. The second step is to get mentally prepared. Prepare for tomorrow because you never know when the day before, is the day before.